Monday May 5th 1879 Miss Swartz came this evening and we all began sewing. Got a start on Hatts new dress and something to our old dresses of last summer that was are working over. I went to town after supper for thread and things and ordered me a hat and got a new calico dress for mother. 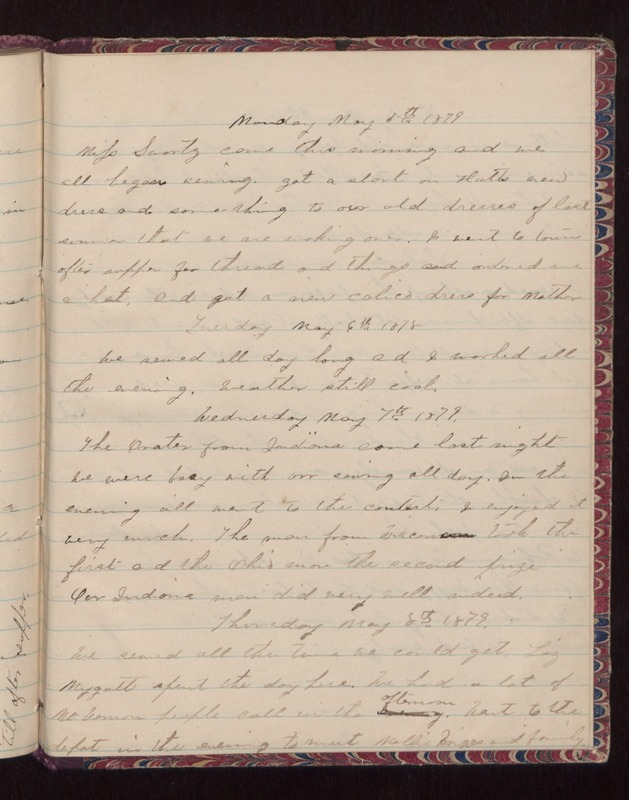 Tuesday May 6th 1879 We sewed all day long and I worked all the evening. Weather still cool. Wednesday May 7th 1879 The Orates from Indiana came last night we were busy with our sewing all day. In the evening all went to the contest, I enjoyed it very much. The man from Wisconsin took the first and the Ohio man the second prize. Our Indiana man did very well indeed. Thursday May 8th 1897 We sewed all the time we could get. Liz Mygatt spent the day here. We had a lot of Mt Vernon people call in the afternoon. Went to the depot in the evening to meet Mollie Briggs and family.